From bestselling author Bill Bryson comes this compelling short biography of William Shakespeare, our greatest dramatist and poet. Examining centuries of myths, half-truths and downright lies, Bill Bryson makes sense of the man behind the masterpieces. As he leads us through the crowded streets of Elizabethan England, he brings to life the places and characters that inspired Shakespeares work. Along the way he delights in the inventiveness of Shakespeares language, which has given us so many of the indispensable words and phrases we use today, and celebrates the Bards legacy to our literature, culture and history. 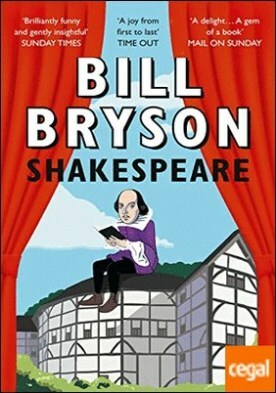 Drawing together information from a vast array of sources, this is a masterful account of the life and works of William Shakespeare, one of the most famous and most enigmatic people ever to have lived not to mention a classic piece of Bill Bryson. BILL BRYSON Bill Bryson nació en Des Moines, Iowa, en 1951. En 1977 se instaló con su esposa y sus cuatro hijos en North Yorkshire, Inglaterra, donde residió durante dos décadas. Actualmente vive en Estados Unidos. Es autor, entre otras obras, de los bestsellers internacionales Una breve historia de casi todo (2003) (Premio Aventis al mejor libro de ciencia general y Premio Divulgación Científica Descartes), En las antípodas (2000) y Shakespeare (2007), todas ellas publicadas en esta misma editorial. La habilidad narrativa de Bryson y su claridad conceptual le permiten tratar de un modo original y divertido los asuntos más variados, desde la ciencia y los viajes hasta las biografías literarias.